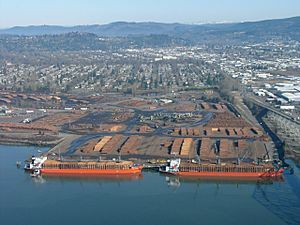 Timber for export, Port of Longview, 2008. The Port of Longview is a deep-water port authority located in Longview, on the Columbia River in southwest Washington, United States. It was established in 1921 by Washington state law, and operates as a unit of local government. The port is overseen by a locally elected, three-member board of commissioners. Each commissioner is elected for a six-year term and is directly responsible to the voters for port operations. The Port manages and operates a marine terminal complex where domestic and international ships and barges arrive and depart, and bulk, break bulk and project cargos are loaded or unloaded by local labor union workers. 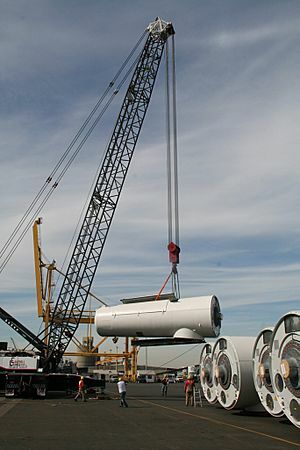 Union workers operate lifting and moving equipment including cranes, forklifts and reach stackers. These workers belong to the International Longshore and Warehouse Union Local 21. Transportation routes connecting to the Port include the Columbia River shipping channel, the BNSF Railway and Union Pacific railroads, and north-south Interstate 5, the main highway running from Mexico to Canada. The Port also leases industrial land and contributes financially towards recreational projects in Cowlitz County. "To provide expansion and development of foreign and domestic trade, to encourage commercial and industrial development, and to enhance waterfront recreational activities for the economic benefit of the citizens of the Port district." The Port of Longview is located 66 river miles inland from the Pacific Ocean on the deep-draft Columbia River shipping channel. It is approximately 120 driving miles from Seattle, Washington and 40 miles from Portland, Oregon. The Port district occupies the northern two-thirds of Cowlitz County, from just north of Kalama, Washington to the Lewis County line. The BNSF Railway and Union Pacific railroad main lines run parallel to Interstate 5 approximately five miles from the Port. The Longview Switching Company switches trains from the railroad main lines into the Port. From there, Port locomotives move trains and rail cars to the marine terminals and industrial locations. The Port is located approximately three miles from north-south Interstate 5, the main roadway stretching from Mexico to Canada. Facilities include eight marine terminals (docks), covered and uncovered warehouses, and open storage areas for temporary storage of cargo prior to loading on trucks, specialized trailers or rail cars. In 1911, the state of Washington enacted laws allowing people to establish port districts and elect commissioners to administer those districts and oversee their development and operation. Originally established as the Port of Kelso, the Port was later changed by a vote of the people, to the Port of Longview, because a state law required ports to be named after the largest city within the district. Original cargo activity consisted of forest products (logs and lumber) exports to Asia. These exports began to decrease in the 1980s, and today are no longer handled by the Port. To replace log cargos, the Port now handles steel, bulk and project cargos. Port of Longview Facts for Kids. Kiddle Encyclopedia.